In this eighth-grade humanities lesson, students make broccoli macaroni and cheese and lemonade, and compare the proportion of consumer dollars that go to different players in the food system for from-scratch and boxed macaroni and cheese options. Students analyze and discuss the differences between mac and cheese options, and debate the role consumer responsibility should play in food choices. This is the fifth in the Debate Plate lesson series, a six-lesson series that focuses on factors and considerations that influence personal food choices and the impacts of those choices. Describe a range of jobs that people have within the food system. Explain how the more highly processed a food is, the smaller a proportion of the cost of the food will go to the farmer. Explain how multiple factors interact to inform any given food choice, and that there is no such thing as a “good,” “bad,” “right,” or “wrong” food choice. Brainstorm jobs held by people working in the food system. Explain why the farmers involved in producing ingredients for from-scratch macaroni and cheese receive so much more money proportional to cost than farmers that produce ingredients for boxed macaroni and cheese. Identify from-scratch, Kraft, or Annie’s mac and cheese as the best choice in a variety of hypothetical situations. Welcome students back to the kitchen. Remind students of the overarching questions of the week: What factors influence what we eat, and what are the impacts of those choices? Prompt students to recall the themes they have covered so far: Health & Nutrition, Environment, and, yesterday in the classroom, Labor & Justice. Explain that today we will be continuing their discussions from the previous day on Labor & Justice and making macaroni and cheese and lemonade. Define labor and justice as a lens for thinking about food choices: How do our food choices impact other people? This is a big topic. Estimates say that 20 million people in the US work in the food system. Our food choices have real impacts on the lives of these people. Who are these people? What do they do? Ask students to brainstorm a few of the jobs people have within the food system (farmer, farmworker, meat packer, grocery store worker, food scientist, corporation executive, truck driver, restaurant cook, packaging designer, etc.). Today we are going to focus on farmers. Specifically, we are going to compare how your choice between three different kinds of macaroni and cheese impacts the farmers involved in producing the ingredients for them. Who are the farmers involved in making macaroni and cheese? Wheat farmers and dairy farmers. We did some research to find out where your money goes when you buy these three different kinds of macaroni and cheese. Specifically, we wanted to know, for each of these choices, how much of what you spend ends up going to the farmer? Introduce and explain how to read the visual aid (all the numbers still covered). Start on the left with Kraft. Ask for students to make predictions about how much money will go to the dairy and wheat farmers involved in making cheese and pasta for Kraft. Reveal the amounts for Kraft. Ask students to respond to what they see: Does this seem like a lot or a little? Clarify that these numbers do not represent profit for the farmers. This is what farmers are paid for their raw products. What costs must the farmer cover with this money? Ask for students to make predictions for Annie’s. Do they think farmers will receive more or less than they do for Kraft? Why? Reveal numbers for Annie’s. Ask for students to explain the similarities in farmer pay between Annie’s and Kraft, and to explain the higher cost of the Annie’s product. Where does that money go? Is this what they expected to see? Ask for students to make predictions for the from-scratch mac and cheese. Reveal the amounts. Ask for students to explain the significantly higher amount received by the dairy farmer and the equal amount received by the wheat farmer. Explain that processing milk into cheese happens in-house at the creamery that we buy our cheese from. This means that the farmer keeps everything that doesn’t go to the grocery store where we bought the cheese. 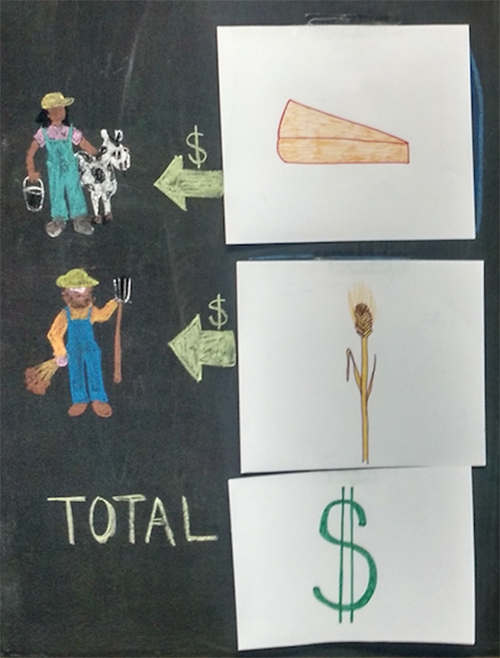 Ask students whether this means that the from-scratch farmer makes a larger profit than the Annie’s or Kraft farmers. Not necessarily—the from-scratch farmer has much higher overhead costs processing milk to cheese as opposed to just producing milk. Ask for students to reflect on what they have just learned, and consider the fact that the average annual salary for managers at dairy processing plants is about $125,000 (about $50 an hour) while the average annual salary for dairy farmworkers is about $25,000 (about $11 an hour), one-fifth of what managers make. Ask students to consider that choosing between these macaroni and cheese options is about more than who gets how much money—it is also about what kind of food system you choose to support. Ask students: If you are looking to support farmers, what’s the best choice? From-scratch. What about if you are looking for the most budget-conscious option? Kraft. What if convenience is your top priority? Kraft or Annie’s. And what if protein content is important to you? From-scratch. There is no objective “best choice.” We’ve seen today how different choices impact farmers differently and help to support different kinds of food systems that treat the people in them differently. If labor and justice is your main consideration, being informed about how the people who make your food are treated will be important as you make your choices. Ultimately, every time you eat, the best choice will vary based on your priorities. In this case, just like on Monday and Tuesday, more information empowers you to make choices that align with your priorities in any given moment. Small-group check-in: What is your favorite way to eat pasta or noodles? What is your favorite kind of cheese? Introduce jobs for the day in more detail. Describe how making a roux is a versatile cooking technique that can be used to thicken many kinds of sauces and stews and serves as the basis for many foods, such as hollandaise and gumbo. Have students choose cooking jobs. Is this a recipe you would make at home? Does knowing about the “justice and labor audit” of the different kinds of macaroni and cheeses impact which one you would choose to make? Why or why not? Do consumers have a responsibility to be informed about the food they eat? Why or why not? Should it be the consumer’s responsibility to do research to inform themselves or should producers be held responsible for educating their consumers? If there’s time, reflect on discussions from the small table groups. Macaroni and cheese: Students are very excited to make this familiar food. They may also be skeptical that a from-scratch version can be delicious as well. Labor and “justice”: We wanted this lesson to get to the theme of justice, but we don’t feel that we made it there with this version, which focuses mostly on labor. We are excited to bring the theme of justice more explicitly to the front of this lesson next year. Support students to do the thinking work: We found the Chef Meeting to be highly successful when we really encouraged students to explain what they were observing and interpreting from the visual aid. The visual aid supports them well to reach a variety of important and interesting conclusions. Cardboard boxes: Having the actual mac and cheese boxes as examples for the Chef Meeting helps to generate enthusiasm and interest among students. We always make a point to let students know that they’re empty because we ate them already. This reinforces the tone of non-judgment/non-food shaming we aim to create in our classroom. Food shaming: The goal of this lesson was to provide information that would empower students to feel a greater sense of agency around their food choices. We explicitly sought to avoid food shaming students at any time. Cheese sauce: By simplifying the cheese sauce recipe instead of making a traditional roux, we make it more foolproof. Experiment with different flavors by trying this recipe with any cheese that melts well. Grating cheese: Sometimes students have a hard time using the grater. Show them that applying pressure into the grater gives you better product and makes the process more efficient. It can also be helpful to remind them that they don’t have to grate into a cup measure—grate onto a plate and then measure. Dietary restrictions: We always have gluten-free noodles on hand, as well as vegan cheese, so that every student can enjoy the meal. If for any reason we don’t have appropriate substitutes, we’ll offer a piece of fruit. Broccoli: Many students are skeptical of this variation from tradition. Sometimes we point out that it’s simply another vessel for cheese sauce, or suggest that it get cut in larger pieces so if they really don’t like it they can eat around it. Despite any initial trepidation, we find that generally students really like it. Brainstorming other uses for cheese sauce: This can be a fun way to generate enthusiasm and creativity. Bread crusts: The bread crusts leftover after preparing the bread crumb topping are excellent for dipping in the cheese sauce. Students also get very excited about enjoying them with a simple olive oil and salt dip. Lemonade: The first time we taught this lesson, we just made mac and cheese and often classes would finish early and have a little too much idle time. We found that the lemonade recipe added the perfect number of jobs and that students were very excited to make it. Simple syrup: We like to show students how to make a simple syrup for the lemonade so the sugar doesn’t collect at the bottom of the pitcher. Hot sauces: We always have a variety of hot sauces available. Different students identify with different hot sauces, and we find students are excited to see their culture represented in the space. It can be a great conversation starter to ask students which hot sauce is their favorite, or whether they like to eat different kinds with different foods. Highlighting recipe sections: This mac and cheese recipe contains a number of moving parts. We like to highlight either the cheese sauce, the macaroni and broccoli, or bread crumb topping section on each recipe we print out. This helps students identify which specific steps they are responsible for, and enables them to work more independently. Salting water: Share with students what a difference to flavor it makes to salt the water before cooking the macaroni and broccoli. Cooking the broccoli: Add the broccoli into the pasta when it is a few minutes from being done as opposed to cooking it separately to save time. Talking mac and cheese: Asking students about how they like to eat their macaroni and cheese can be a great conversation starter. Many students will have experience eating or making this food. If you were to make this at home, what would you add or take away?